Discover the secrets of award-winning branding in issue 284 – on sale now. Can it really be September already? That can only mean one thing – the latest issue of Computer Arts magazine is on sale now. Issue 284 is all about branding, and in its pages you'll discover what it takes to create award-winning identities. 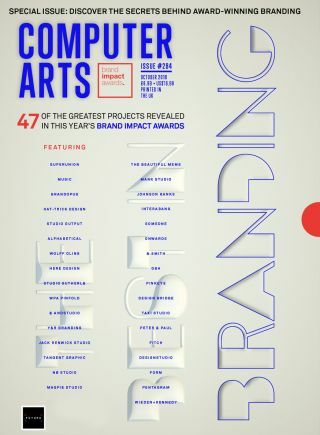 We also take a look at the 47 amazing projects in the running for this year's fifth annual Brand Impact Awards, and find out who came away with a trophy. Followers of the awards will be all too aware of the tough selection process that goes into picking the winning projects. With the aim of selecting and celebrating excellence, the Brand Impact Awards are so brutal that if the expert panel aren't all in agreement when it comes to a project, then the category simply won't have a winner! Elsewhere in issue 284, Emily Gosling talks to some of the best full-time and freelance illustrators to learn how they stay motivated and avoid drawing a blank. Meanwhile, Jacqui Oakley walks us through her fierce approach to Reebok T-shirt design, and Magpie Studio explains how investing in the happiness of its staff has led to award-winning work with a playful spirit. Can businesses survive the retail apocalypse?